After a bumpy week and a week of all abouts and over its, things have calmed down some. It's been a normal level of busy for the past week and a half, and I definitely prefer it. But it hasn't been complication-free, and I'm wondering how all of you handle these little scheduling challenges. Here's how things are going down for this three week stretch. Last week, Max got sick. It wasn't a huge deal, but he did have a fever. I figured it would mean missing two days of school, and so Marc and I compared calendars. I had a big meeting the second day Max would be out of school, so I took the first day of working at home and Marc took the second. This week, the kids had two early release days from school, meaning school ends for the day at 12:30 instead of 3 pm. Our school district does this every Tuesday (thus my work from home Tuesdays), and six additional days throughout the year. Marc had an early morning thing for work on Tuesday, so I got the kids to school and then went in to my office, and Marc came home in time to meet Hannah from the early release day. Marc picked up Max from aftercare (he goes five days a week) and then did the Hebrew school carpool run and got Hannah. I worked late and got home just a few minutes before they did. On Thursday, the second day of early release this week, I'll be going in to the office for two and a half hours, mainly because I have clients coming in from out of the country, and then I'll be the one to meet Hannah at home again. Next week brings another change to the plans. The state-run exams, MCAS, are going on, and one is held on Tuesday. Since the test can take longer than the normal school day, which again usually ends at 12:30, the Tuesday school day is extended until 3, and there will be a 12:30 early release on Wednesday instead. Our aftercare behaves similarly and pretends that Tuesday is Wednesday and Wednesday is Tuesday. However, the rest of the world doesn't follow this little scheduling quirk, and so life outside of our school goes on as usual. This means Hannah needs to get to Hebrew school on Tuesday (and here I'm praying our dear friends will help us out with that, as they usually do), and on Wednesday she'll be coming home as 12:30 with no plan for the rest of the day. Fortunately, I can switch my schedule and work from home on Wednesday instead, and we are very grateful to our friends for helping out with that Tuesday one hour childcare gap. Now I'm not telling you all this to bash the schools or the systems they have in place (though I may not think they are very family-friendly, I know there are more issues at work here than I can adequately address). And obviously, kids get sick and taking care of them is part of the deal of parenting. But I find all of this juggling and scheduling stressful, and I'm one of the luckiest ones out there, with a supportive spouse and a (generally) flexible work environment. I think we've found some good strategies for coping with these schedule adjustments, but it's something we always make up as we go. What about you? 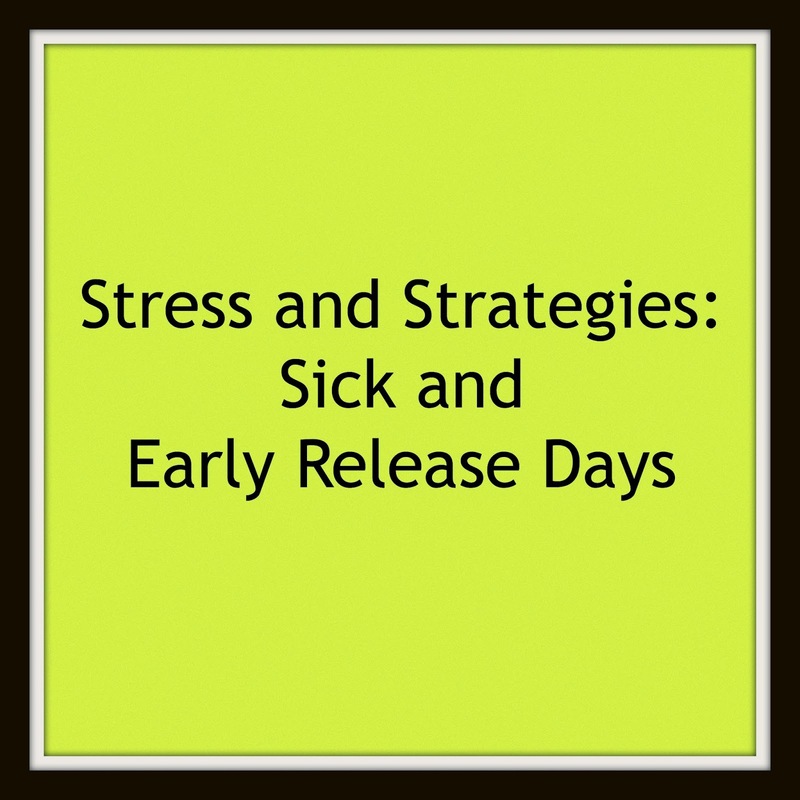 How does your family handle the unexpected and the expected scheduling issues? Share your stress and strategies in the comments! We are less than a year into two working parents and a school aged child, and still flying by the seat of our pants. Our school district and aftercare with the Y are sufficient most of the time, but sick and snow days definitely take their toll. My husband is self-employed outside the home, and has more deadlines and a higher hourly rate, so his time is more "valuable," and I have a far more forgiving work environment in terms of family flexibility and some work-at-home opportunity, so it's more often me who makes the changes on the fly. Still, like you say, the changes are stressful. We also lean heavily on local family, which is definitely a blessing. Yay for de-lurking! Thanks Cam! Yeah, I admit I'm kind of terrified about managing this stuff. We're splitting our two EI meetings a week. I was thinking yesterday that we're going to have to start splitting doctor's and dentist appointments. And since I have the kids 65% of the time they're in school, the odds are good that I'm going to eat most of the sick days. By the end of next week, I'll have missed 2 out of 15 days of work due to a sick kid and appointments. And that's assuming no one else gets sick between now and then. My employer so far has been great about it. I'm just hoping it lasts.